So I was looking at a bunch of old photos on my computer the other day and I found these from 2006 which doesn’t seem like that long ago but when you think about it, it was over 12 years past. 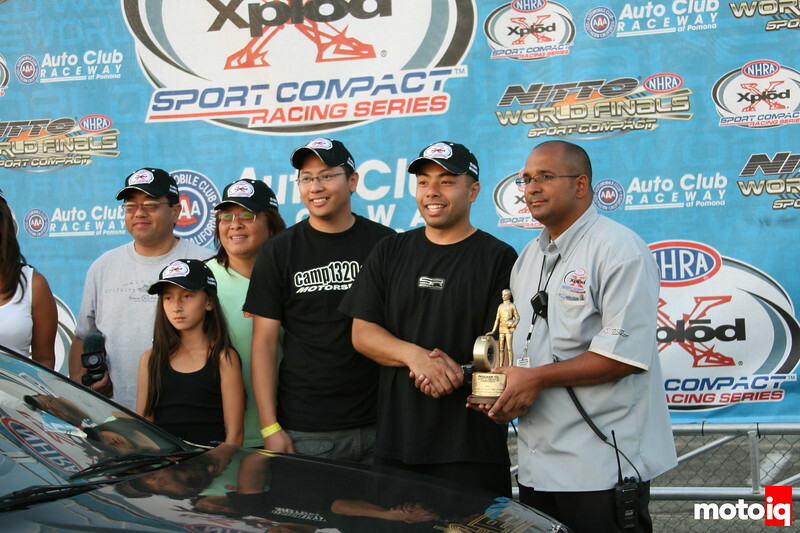 This was a memorable day at Pomona, the NHRA Xplod Sport Compact Drag series final at Pomona. I have never been that into drag racing but I went to see my friend Tyler Hara run and to see another friend Ron Acevedo, who owned IPS camshafts run his motors in the late Saul Salceda’s and Norris Prayoonto’s cars. So while I was there, I took a few snapshots for the heck of it. It was kinda bittersweet as the public’s love affair with import drag racing was running down and I was shocked to see so few people at the event and the stands were only about 1/4 of the way full. 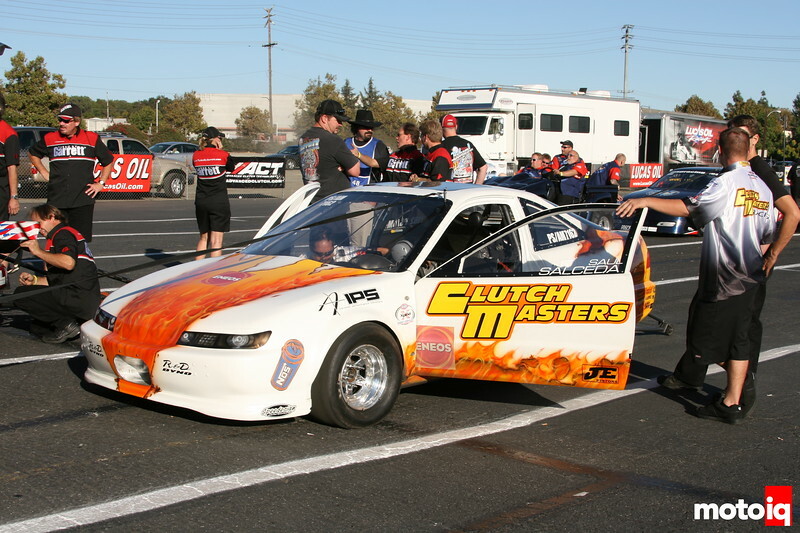 Just a few years before the IDRC was able to pack Pomona to the bursting point with a crowd that was bigger than the NHRA Winternationals The lighting fast decline of import drag racing is another story that needs to be told someday, just not now. 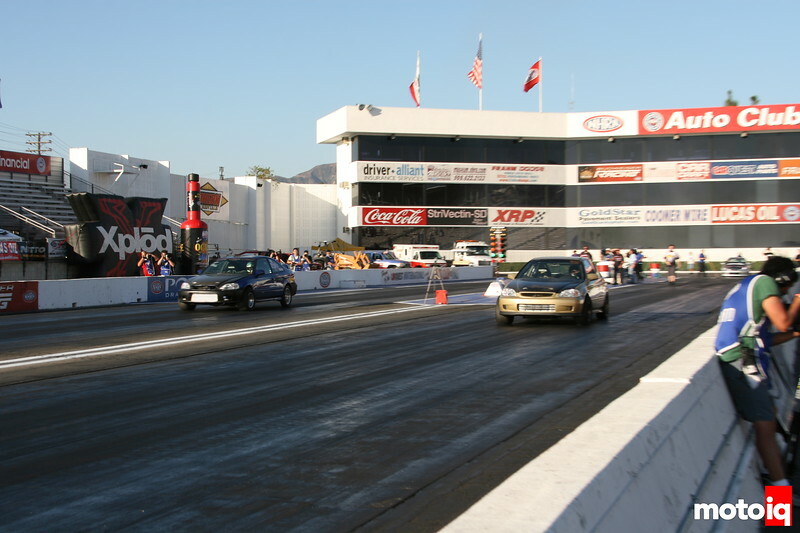 Two years later the event drew about zero spectators and the plug was more or less pulled on the standalone Sport Compact Drag Race, at least the NHRA version. So Tyler ended up winning the popular Sport FWD class with a 10.12@ 147 mph and he might have driven the car home after. He used to drive this car on the street all the time! Here is Tyler on the podium getting his Wally. Here is Tyler with his Wally. This is a great accomplishment. Most people race their whole lives and don’t even have one. At the time Tyler was head engineer over at AEM. Later he would go to Cosworth and now is at mountune USA. Looking at this, Tyler hasn’t aged at all! I think this is Tyler Squaring up against runner up Theodore Aesen in the finals for the win. I am not 100% sure, it was a long time ago. This is a classic picture of my longtime buddy Ron Berganholtz. Ron and his brother Ed won Pro FWD that day in their Mazda and I have no idea why I have no picture of the car or any of the runs. I used to hang out with Ron but he moved to Texas a few years ago and I only see him during Formula Drift rounds now where he does support for Nitto. Ron is one of the funniest guys ever and happens to be super smart and it’s sad not to see him field a car in some sort of racing now. Here is Saul Salceda’s DC2 Integra. He went on to take the top slot in the all motor class beating out his teammate Norris as well as Jeremy Lookofsky and Leslie Durst. Ron was super happy that weekend. didn’t import drag racing fall off a cliff when drifting came around? I always thought thats what killed it… to the average level car enthusiast, drifting is much more exciting to watch… and its much easier to convince a gf that doesn’t care about cars to come out to a drift even than a drag racing event. but I mostly came around when the car builds started getting serious and there was stuff to nerd out about. drifting is definitely more fun to watch than drag racing. I scratch my drag racing itch by watching 1320 vids every once in a while… but drifting is much more entertaining live than in vids… and my own driving I prefer track days, which is incredibly boring to watch… although COTA TA coverage was cool with outside video of the full lap. I don’t know, James Deane is really good, probably the best in the world, it’s not bias. Yes, he is really good, and I’m not saying he doesn’t deserve any of the win’s he gets, he deserves most of them… but anytime he does make a mistake, unless its a huge mistake, it more or less gets ignored. the most glaring one I can think of right now was when he clearly lost to Odi and instead of being handed the loss they gave him an OMT to try again. I really don’t think the judging is intentionally biased. I mean you don’t attend the drivers meeting and are not briefed on what exactly the judges are looking for. Of course, you are right that the judges are not unfailable but that’s one of the reasons why they are three of them and there is a standardized judging criterion that all drivers are briefed on many times over the course of an event. but they do announce what they’re looking for on the live stream before the event starts… so I do know what the judges are looking for at a particular event. JD just always get the benefit of the doubt while other drivers don’t. In one run they’ll say JD get the win cause despite the fact that he had less speed he had a better line hitting all the clipping points, the next run they’ll say he gets the win because he had better speed despite not hitting the clipping points. must be frustrating for other drivers, listening to the judges explanation of why JD won, next run beating JD in that category, just to have the book flipped on him. I know judging is hard, I know JD is an amazing driver, I’ll even agree with you that he probably is the best in the world as far as drifting goes. but judge him consistently, to flip the book every time to better suit the run JD just had. And I do think he deserves most of the wins he gets, but he also gets more undeserved wins (and/or OMT’s) than any other driver in FD. I thought it was Chevy getting in and dominating with it’s unlimited budget that killed it. The corporations took the sport out of it. Which makes sense as it went back underground and is now blazingly fast and exciting again. Hahahaha, I didn’t want to say it but you did first!